Early in December, the New York Times published a review of Emer O'Sullivan's new book about the family of Oscar Wilde, The Fall of the House of Wilde: Oscar Wilde and His Family. The review introduced me to Oscar Wilde's mother, Jane Frances Agnes, who became lady Wilde after her husband was knighted in 1864. I knew nothing about her--to be absolutely honest, I never thought about Oscar Wilde even having a mother! 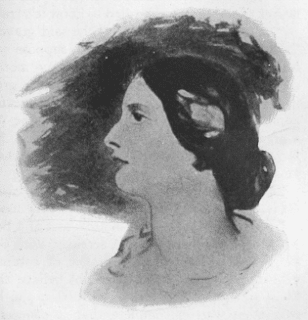 A gifted linguist, she published several translations of French and German works, including Wilhelm Meinhold’s gothic horror novel Sidonia the Sorcess, in 1849, which was reprinted in America; a philosophical novel from the German, The First Temptation, or Eritia sient Deus (in three volumes); Lamartine’s History of the Girondins, as Pictures of the First French Revolution (1850); Lamartine’s Nouvelles Confidences, as The Wanderer and his Home (1851); and Alexander Dumas’s Impression de Voyage en Suisse, as The Glacier Land (1852). Her first volume of poetry also contained translations from several European languages. In addition to supporting the cause of Ireland, Wilde campaigned for and wrote to defend women's rights and their need for access to education. In an 1850 essay in The Nation, she wrote, "Women truly need much to be done for them. At present they have neither dignity nor position. All avenues to wealth and rank are closed to them. The state takes no notice of their existence except to injure them by its laws." In 1883, in "A New Era in English and Irish Social Life," published after the passage of the 1882 Married Women's Property Act, she praised the change, noting that the institution of marriage would no longer treat a woman as "a bonded slave, disenfranchised of all rights over her fortune." Genius never yet unsexed a woman, or learning or culture ever so extended; but the meanness of her ordinary social routine life, with all its petty duties and claims, and ritual of small observances, degrades and humiliates her, for it deprives her of all dignity, and leaves her without any meaning in God’s great universe. Now, for the first time in the history of the world, a path is opening to female intellect, energy and talent, and, henceforth, women, perhaps, may lead in the learned professions, take their part in home government, form ministries to organise the code of female rights, and claim the highest university honours in rivalry with men. 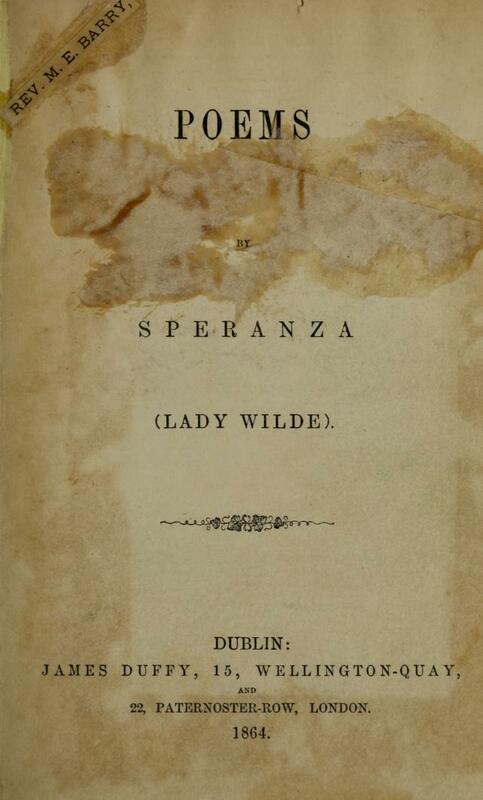 In addition to the works noted above, her publications include: Poems (1871); Memoir Of Gabriel Beranger (with her husband, Sir William Wilde, 1880); Driftwood From Scandinavia (1884); Ancient Legends, Mystic Charms, and Superstitions of Ireland. With Sketches of the Irish Past… to which is added a chapter on “The Ancient Race of Ireland” by the late Sir William Wilde (1888); and Notes On Men, Women, And Books (1891). When Jane Wilde died in 1896, her son, Oscar, was in prison after his conviction for gross indecency. Her request to see him before she died was denied. 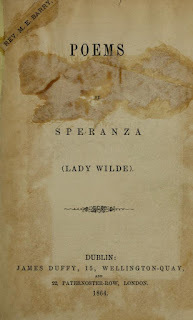 Many of Lady Wilde's books are available at the Internet Archive--you can reach a list of her publications by clicking here.